John Cutteridge and his wife came to Newburgh from Cambridgeshire, England in 1851. 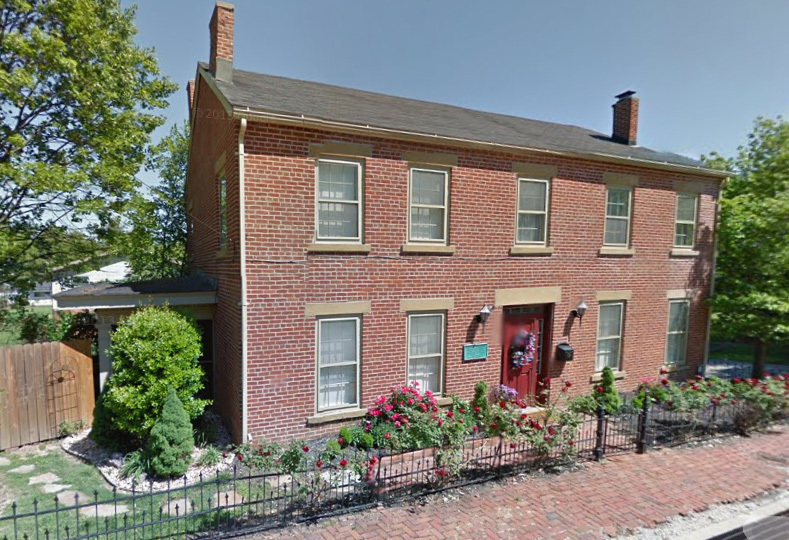 They built a simple two room brick house on the corner of Cypress and Main Street. Cutteridge and his wife added to their house with bricks fired by Joshua Gray in the village of Newburgh. John was a proprietor of the town’s first livery, feed, and sale stable. He was listed in the Historical Atlas of Warrick County as one of the first business references. The home is a two story brick structure with a feel of Federal style architecture. It has a well-pitched roof and a chimney on both sides of the house. There is a sandstone fireplace in the living room parlor. The windowsills on the outside of the house are also of the same sandstone. The cellar walls and floors were constructed of brick. The walls of the house are 12 inches thick. The inside walls are also of brick. The floors of the house were wide poplar boards. In later years a side porch was added to the west side of the home. The Cutteridges had five children, including a daughter Dorcas who married Nealy Curtis. Mr. and Mrs. Curtis made the Cutteridge home theirs for their married life. They celebrated their golden wedding there in 1935. A son, John, was born to Dorcas and Nealy Curtis. John Curtis had two children, one being Louise Curtis Barr. Mrs. Barr owned the house until 1965, when she sold it to Mr. and Mrs. John Stephenson and their six children. The house had been vacant for 10 years and was the victim of weeds and overgrowth that nearly obscured the home. An open well had rotted the floors in three of the rooms on the first floor. Falling brick left gaping holes in the walls and there was no central heat or running water. The Stephensons, together with their children, restored the house and furnished it with Victorian antiques of the style used by the Cutteridge-Curtis family.